The Model 43 is a machine that is at once mysterious, puzzling and highly sought after. Mysterious in that very little is known about this model, puzzling as there are many variations of this model, and highly sought after due it’s overtly complicated mechanical make-up, quality of construction and it’s displayability. The model 43 in my collection is a 7 lever/wheel model. It weighs 2 lbs 8 oz and measures 4″W x 3.5″L x 7″H. The exact dates of manufacture are not known but I do know that in 1939 there were a number of different variants being produced and it was advertised that they could be customized to your needs. While the machine has “patents pending” stamped on the front no patents seemed to have ever been granted. 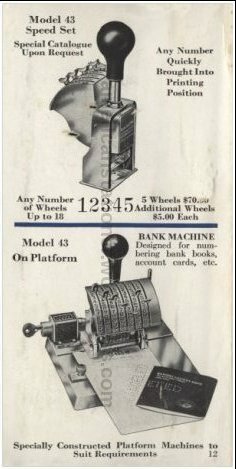 In 1939 a base 5 lever/wheel version of the Model 43 was being advertised for $70 and there was a $5 additional charge for each additional wheel mechanism. That means that my 7 lever/wheel model would have cost approximately $80. Even by 2014 standards that’s pricey. However, when you factor in inflation $80 of 1939 dollars equates to a staggering $1,400 in 2014 dollars. You know then that this would be considered a very serious piece of equipment. 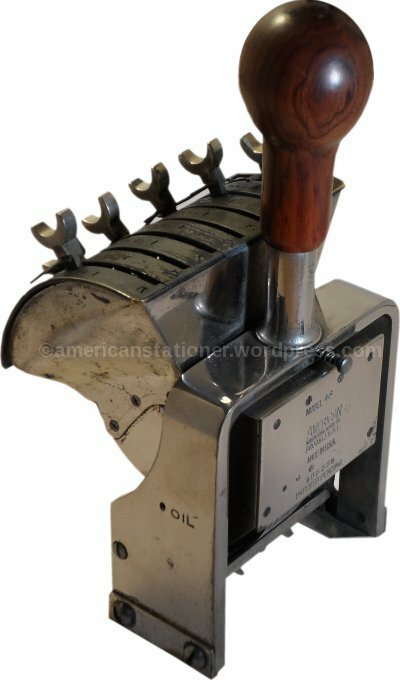 The American Numbering Machine Company made these in four basic configurations; the Model 42, Model 43, Model 43J, and Model 44. Then each model came in at least two versions, a hand-held model (as pictured) and a platform mounted model. The Model 42 was basically a 3 wheel machine with two number settings and a fraction setting. The Model 43 was based on the Model 42 but usually consisted of wheels with the numbers 1 through 0 and a dash. However, letters could either substitute for or be added to these wheels. Furthermore, the Model 43 could be “made with any number of print wheels”. Or it could be made with 18 wheels max. It depends on which company brochure you read. The Model 43J was basically a Model 43 but built for print position accuracy and to give an especially neat appearance. This would have been accomplished through using a very accurate print guide on the machine. The platform mounted models would have been used in such places as banks, department stores, and for time recording uses. Numbering machines were introduced in the mid-19th century with Bates being one of the early manufacturers and arguably the most successful. Bates was so successful, especially in the legal arena, that the numbering system used in the courts was called the Bates Numbering System. As a matter of fact, this term is still used today even when a numbering machine isn’t being used. For example, you can automatically number all the pages in a .pdf document using the Bates Numbering System with Acrobat. I mention this as most businesses no longer have a particular need for such a device. But at one time they were an essential business tool and there were a number of manufacturers ready to fill the needs of these businesses. 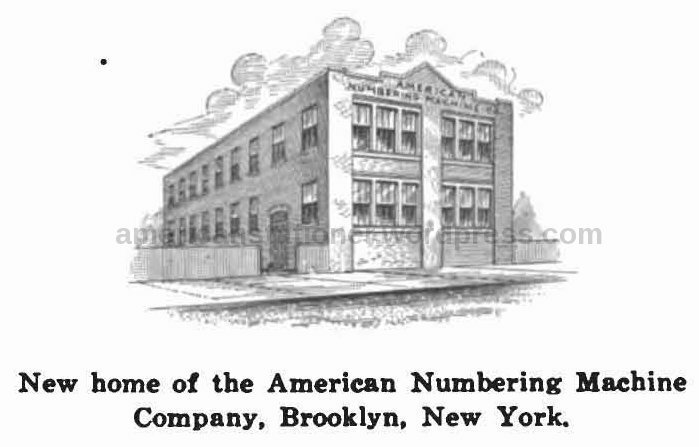 The American Numbering Machine Company had a number of successful products and held a number of patents. 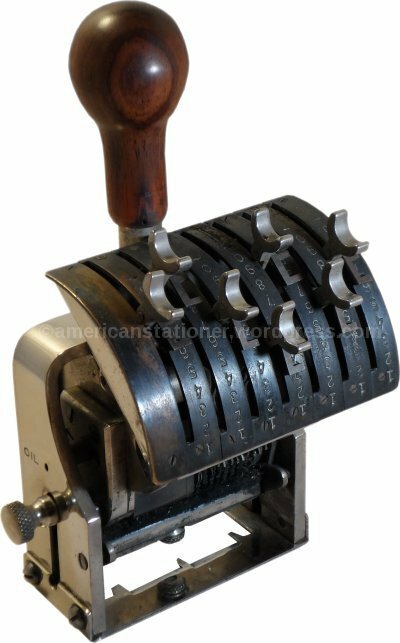 The American Numbering Machine Company was established in 1908 with the introduction of the Model 30 Numbering Machine for printing presses. 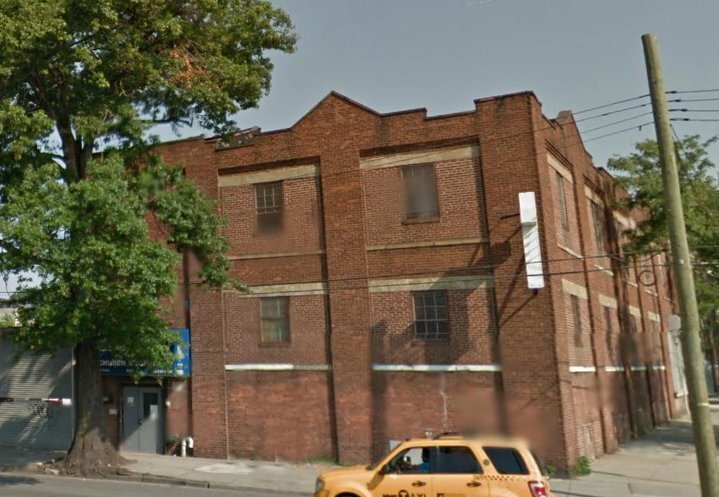 In 1912 they were so successful that they built their own factory in Brooklyn, New York at 224-226 Shepard Avenue. Information about the company is nearly non-existent but I have found reference that they were still in business in 1966 at that same Brooklyn address. An as of yet unsubstantiated source states this building was sold in 1971 meaning that the American Numbering Machine Company likely went out-of-business between 1966 and 1971. That same address in 2014. It’s some kind of religious center now. A final word about these old numbering machines. They are usually very high quality and while they might need a bit of cleaning should still work fine. If you have a use for them I’m telling you it’s ok to go ahead and put them back into action. However, be aware of what you’re doing. These machines (and most modern ones) are “self-inking”. All this means is that there is a pad of some kind soaked in ink that sits against the print wheels or print head (this pad is moved out of the way when you depress the stamp). These pads can be easily replaced and since they are usually made of a felt-type material can be cut to the needed size. What you really need to watch out for is the type of ink you use. Since most modern stampers are made of a rubbery material they work best with a water-based ink. Most antique and vintage machines are made of steel or iron. Keeping in mind that the ink-soaked pad rests against the print wheels if you use a water-based ink you will (not maybe) ruin your device. You must use an oil-based ink for these which can be a bit harder to find, although they are still made. If you’re simply going to display your device I would recommend not replacing the pad or re-inking it. page 31, A.F Lewis & Co. ed. (1918) Printing Trades Blue Book, Greater New York edn., New York, NY: A.F. Lewis & Co.